Book car rental Dijon at the lowest rates! 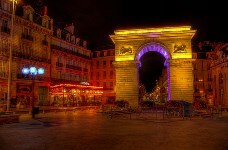 Complete our search form and enjoy amazing scenery this city with cheap car rental Dijon! 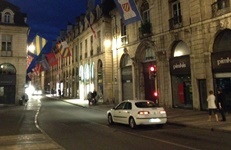 Car rental Dijon is the best key to enjoy the great scenery of this city. Car rental Dijon allows you to save your money as we offer you the best car rental deals worldwide! Besides, the booking procedure is quite simple and fast and if your plans change you can amend or cancel your booking online easily and quickly! 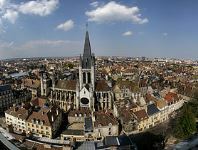 Forget about all the car rental hassle and make your holidays in Dijon one of most memorable events in your life! Choose the suitable Dijon car rental location and get acquainted with Must Know and Places to Visit with car rental Dijon! Dijon is the capital of Burgundy wine region and the center of the department of Côte d'Or. 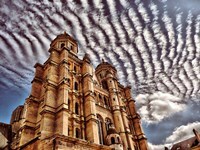 This city has a long and eventful history and has left a legacy of beautiful architecture for its inhabitants, the second largest after the Louvre Museum of Fine Arts (le Musée des Beaux Arts ), a first-class gastronomy and unique natural landscape. And even if someone has never heard of the famous Dijon mustard (la moutarde de Dijon), he knows one of the most popular residents of Dijon, Gustave Eiffel, who created the most famous symbol of France. It is significant that at his birthplace nothing reminds of his achievements. It may seem quite unusual that even a large city has a huge number of streets with one-way traffic. Close to many major areas there are intersections with traffic organized in a circle. When entering on the circle you should give way to drivers who commit maneuver right. And when driving you should stay as close as possible to the right lane of the road and the left lane can be used only to make overtaking. An elegant Darcy Square is the starting point for the tourist route in Dijon. It was named after a native of Dijon who rescued France from the fetid odor - Henry Darcy. This man has created Europe's first sewage treatment plant with filtration fill. Take advantage of your car rental vehicle and visit Darcy Square! Drive your car rental vehicle right to the heart of this rich city – to the Liberty Square with the famous architectural monument which once served as the residence of Burgundy Dukes and then the seat of the parliament. Luxury building which has spread its wings far beyond the semi-circular area was built and rebuilt over the centuries. 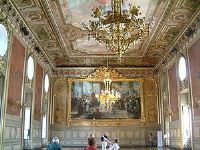 It all started back in 1365, so it is not surprising that in the palace architecture harmoniously blended just three styles: Gothic, Renaissance and French Classicism. Botanical Park is located within a large park (5 ha) embedded in the XVI century for the Knights who were practicing harquebus shooting. Dijon poet Aloysius Bertrand in the introduction to his "Night Gaspar" confirms that the name of the garden comes from the harquebus, of which the knights once a year were shooting the birds. Drive your car rental vehicle to this place to have a stroll in the beautiful garden and take photos. You must see this unusual, a bit eclectic, but no less beautiful church of the Archangel Michael at sunset, when the light-gray sandstone walls emits a pink glow, it is altogether compelling. The majestic and refined structure, whose monumental harmony with grace, appears to us in the form of a fairytale castle with high towers and round stone domes. Don’t miss your chance to enjoy this beauty – get in your car rental vehicle to reach the church. RentalCars24h.com offers you reliable car rental Dijon services that will help you to feel free and independent when moving around the town. Providing best online prices for car hire Dijon services, RentalCars24h.com allows you to save money each time when you rent a car in Dijon.